When Prince Althérion of Tolfolas joined the heroes of the Glaurung, he also brought a small contingent of his household guard with him. Although young, these soldiers are highly trained, battle-tested, and above all, devoted to the protection of the Prince. As soon as I painted up the figure for Prince Althérion, I knew that I also wanted to include some soldiers of Tolfolas among the crew of the Glaurung. 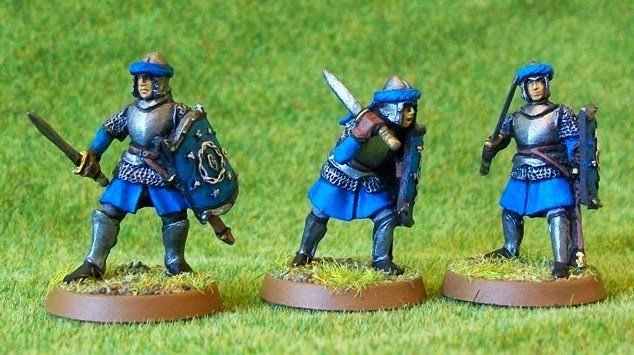 I wanted the figures to be distinct from the soldiers of Minas Tirith, but also, because they are mainly dressed in blue, I didn’t want them mistaken for soldiers of Dol Amroth either. After seeing what was available, I bought a pack of soldiers of Arnor. The only thing I didn’t like about these figures was their spears. 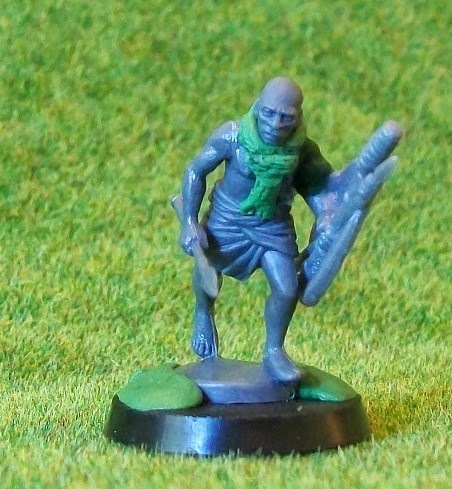 In general, I don’t like metal miniatures holding spears in one hand. They invariably get bent and never get straight again. (This happens to all metal miniature weapons, but looks worse with spears). So, I clipped off their spears and gave them each a short, heavy sword. I thought this weapon was a good fit with the heavy shield. I also gave the swords long hilts so they could be wielded two-handed, should a solder be caught without his shield. These figures were relatively quick to paint, as they are predominately silver and blue, without too much detail. The only exception is the shields, which were a bit tricky to paint with their intricate decoration. I suppose these are symbols of Arnor, but they meant nothing to me, so I’m happy to have them represent the Princedom of Tolfolas. With these guys finished and ready to sail, I’ve only got two figures left to paint to reach the full complement of thirty that I wanted for the Glaurung. The ship is almost ready to sail. Since I had so much fun assembling my first two Mahud warriors the other day, I decided to move them to the front of my painting queue. There is very little information regarding the warriors of Far Harad. Tolkien mentions that some fought at the battle of the Pelennor Fields, saying they were ‘black men like half-trolls with red tongues and white eyes...’ It’s not a lot to go on. In the movie, we see a couple of men from Far Harad serving as drivers for the Mumaks. Both are dark-skinned, bald and covered with garish red and white face paint. It’s a rather effective ‘warrior look’ in my opinion, and I decided to use it as the basis for my own warriors. For the most part, painting these figures was a little bit dull. Since they are mostly naked, there isn’t a lot of detail to pick out, which is my favourite part. It was only after I got the basic flesh and clothes finished that I really enjoyed it. With my red and white paint, I went to town painting little dots and lines on them, trying to give them that fierce warrior look. For awhile I didn’t think it was working, but when I put a couple of white dots under their eyes, the figures really seem to come together. I think the key for me is to not paint too many of these figures at one go. If I space them out, I am actually more likely to maintain my interest. Anyway, these are the only two I’ve got constructed at the moment, and there are plenty of other figures waiting in the queue. Recently, me and a friend decided to create small, Lord of the Rings theme forces to play Lion Rampant, a new set of medieval wargaming rules, set to publish later this year in the Osprey Wargames series. After thinking it over, I decided on Far Harad for two reasons. First, I will be able to reuse all of the figures for the Glaurung campaign. Second, I liked the variety of troop types available: half-trolls, camel riders, lightly infantry, and, in theory, a Mumak. There was only one problem with my selection. Assembling a Far Harad force of any size, using the official GW figures is tough. 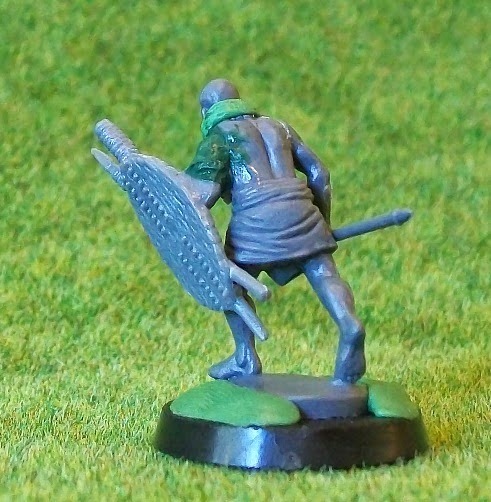 Not only are they expensive, but there are only three different basic infantry figures available. The good news was that I already owned 1 Camel Rider and 2 Half Trolls. So, I splashed a little cash and bought 2 more Camel Riders, another pack of Half Trolls, and one pack of 3 infantry. Those 3 infantry would serve as my sergeants, each leading a squad of five men. Then I turned my thoughts to acquiring the other 15 infantry. 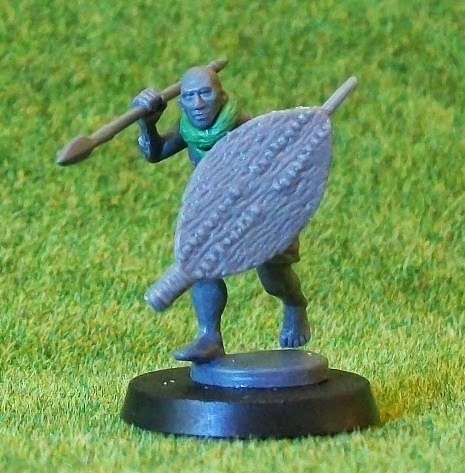 I was pretty sure I wanted plastics, and the closest plastic figures to the Far Harad figures in look are Perry Miniatures plastic Sudanese (which isn’t that surprising since the Perry’s also sculpted the GW figures). To my eyes, the warriors of the Mahud (as GW have named the people of Far Harad), have two distinguishing features, their wicker neck decorations and their large wicker shields. It is my desire to keep this as the common element of the force. This morning I set to work on my first models. 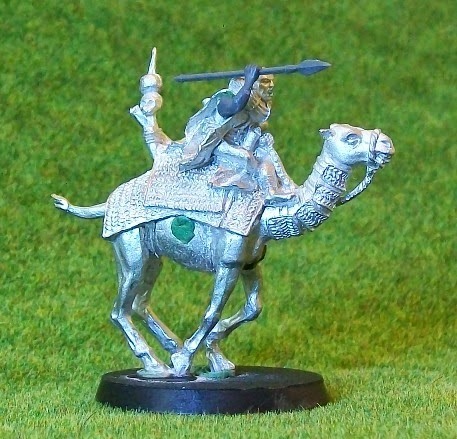 I started with the camel rider, because he was an easy little conversion. This figure came wielding a blow-pipe. I’m sorry, but I just don’t think the blow-pipe is really a war weapon. I discarded the arm and replaced it with a Sudanese spear arm. The consistent sculpting means it looks perfect. Then I set about the harder work. 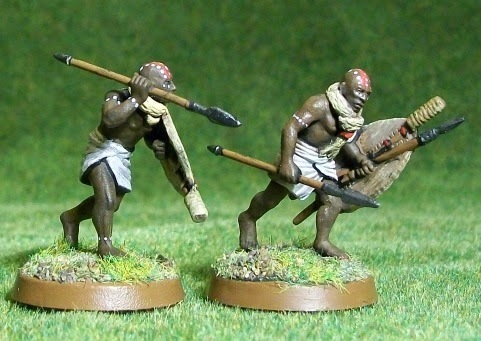 I assembled a couple of Sudanese, using only the bald heads and the bare-chested torsos. I rolled a little noodle of green-stuff, which I wrapped around their necks, and did my best to texture. Hopefully, when I paint them, that texture will show through and make them look at least similar to the GW models. 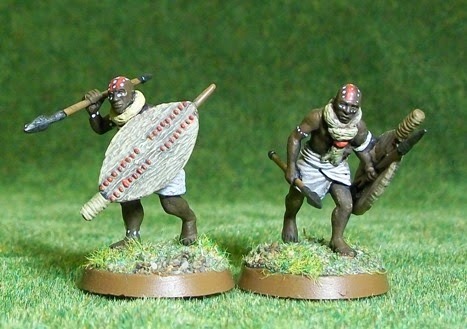 For shields, I gave them Zulu shields from the plastic kit from Warlord Games. The only downside to this, is that most of the shields in the box are attached to forearms. For one figure, I was able to use a free shield and glue it straight to his Sudanese arm. For the other, I had to construct a shoulder out of green-stuff to fill the gap between the torso and the forearm. This is stretching my sculpting to the limit, but it doesn’t seem to have turned out too badly. 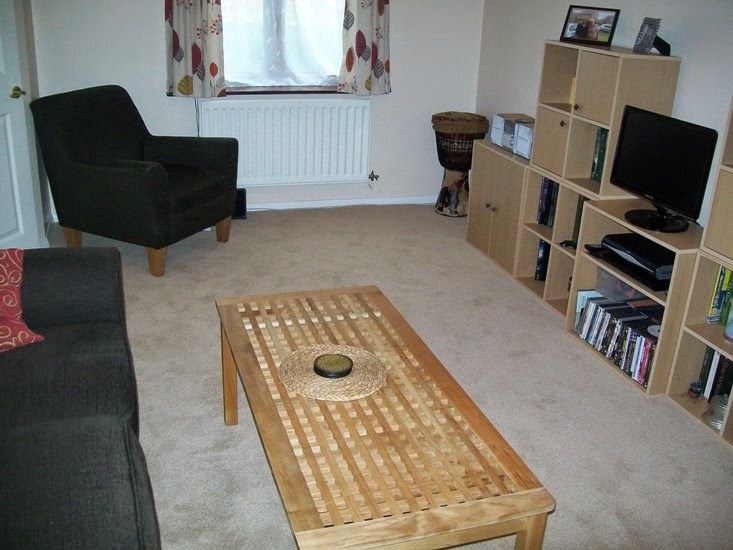 For those of you not interested in carpet, please amuse yourselves by trying to spot the following items: the Moon Lander, the Batmobile, a copy of Children of Hurin.